The notion of culture has been on my mind for a long time now, but after joining the writing staff over at Christ and Pop Culture, I figured it was appropriate to do a little more digging on the notion of culture and cultural analysis. 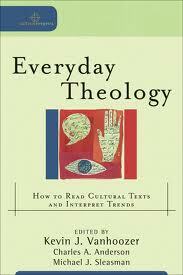 To that end I finally picked up a little volume edited by Kevin Vanhoozer Everyday Theology: How to Read Cultural Texts and Interpret Trends. While there are many volumes out that address the issue of biblical exegesis, there are few that address the crucial task of “cultural exegesis”, the practice of reading culture, interpreting the “signs of the times” (Matt. 16:1-3), in light of God and his revelation. That’s the gap that Vanhoozer and his co-editors (Charles A. Anderson, Michael J. Sleasman) aimed to fill. The volume opens with an programmatic essay by Vanhoozer in which he outlines a theory of culture, as well as a methodology for cultural interpretation. The essays that follow are examples of the method put into practice, with explorations of the check-out line, Eminem, Gladiator, and the blogosphere. In this post I’d like to take a (very) quick look at Vanhoozer’s view of culture and the way it works. Working primarily at the levels of what Roger Scruton has identified as “common culture” and “pop culture”, Vanhoozer’s discussion is fascinating and helpful many ways. One important point to note is his dependence on Dilthey’s idea that cultural studies observes the realm of human freedom, spirit, and creation v. that of nature. On this view cultural artifacts are concrete expressions of the human spirit by which our values, beliefs, and aspirations are given objective existence. As such, cultural artifacts such as songs, architecture, poetry, games, literature, and political practices “call not for explanation but for interpretation.” (pg. 22) Hermeneutics is key. Another distinction he makes is the difference between culture and society; his chosen metaphor to understand the difference is hardware and software. Society is viewed more as the hardware of social institutions that gives shape to the shared life of a people. Culture he says, “is the software that determines how things function and how people relate in a given society. Culture is both system and practice, a means through which visions of the meaning of life (cultural worlds) are expressed, experienced, and explored through the diverse human products (cultural texts).” (pg. 27) So, police are institutional hardware that can be found across cultures, and yet an American “cop” is understood differently than a British “bobby” that usually doesn’t carry a gun. (pg. 23) Same institution, different cultural implementation. The question remains, how does culture do this? Vanhoozer identifies 4 things that culture does to shape our lives. Culture communicates – First of all, culture is constantly communicating to us in ways both explicit as well as subtle, in a variety of formats, media, advertisements, and cultural artifacts. While there are hundreds of different specific messages aimed at a every discernable area of human life, the over-arching goal is to communicate a vision of the meaning of life, and the embodied form it should take. We mustn’t be naive the way this vision is communicated though. As Vanhoozer notes, “form and packaging” are just as important as content here. (pg. 28) Most cultural communication happens not through propositional argumentation but through allusion, suggestion, and connotation. It gives us pictures and metaphors (“life is like a box of chocolates”) that give rise to broader stories about the world we live in; subtle hermeneutical suggestions that shape the way we interpret our lives. Culture reproduces -We need to understand that culture spreads. “Culture spreads beliefs, values, ideas, fashions, and practices from one social group to another.” (pp. 29-30) in the past through institutional force or colonization, but now it mostly happens through memetic reproduction. A “meme” is a “cultural unit” analogous to a gene in that it reproduces and passes itself on by means of imitation (mimesis). This could be anything from an idea, a fashion, phrase, song, or practice. The point is that cultural “programming” is spread from person to person, sort of like a virus, as people encounter each other and begin to copy or imitate the cultural behaviors that they see. This can happen institutionally in schools, or through parental instruction, but more often than not it’s happening informally all the time through everyday interactions with friends, online content, and media saturation. Culture cultivates – Finally, culture “cultivates”–it develops and grows. What does it grow? Well, recalling Dilthey’s point earlier, it cultivates the human spirit. By communicating and creating worlds for us to inhabit, metaphors to live by, or the basic orientation for our lives, culture develops our souls. It gives a vision of the meaning of life for our “hearts”–the seat our willing and acting–to desire and pattern itself against. “In short, culture cultivates character traits–the habits of the heart–and in doing so forms our spirit so that we become this kind of a person rather than that kind.” (pg. 31) The point isn’t that we are helpless against the onslaught of culture’s imagination or affection-shaping power. It is rather that we need to understand that it’s not a question of whether a particular show is educational, but what’s the lesson being taught? (pg. 31) Prolonged exposure to cultural texts presenting us with similar narratives and worlds shape our self-understandings and create a sort of “second nature” for good or ill. (pg. 32) Culture is a spirit-forming reality. Because of this, Vanhoozer calls Christians to wake up and not simply walk about in culture like “sleep-walkers” unaware of the worlds which they are being invited to inhabit. (pg. 32) We need to be discerning readers both of Scripture and of culture, determining which is exerting a greater force on our hearts, and for what end. What vision of the good life are we buying into? What narratives and metaphors have we adopted? Which works and worlds dominate our imagination? The various little texts provided by marketers and other meaning-makers in pop culture, or the works and world of God as found in his Text? Pingback: Star Trek Into Misogynistic Darkness? A short sum up of this thing we call ‘culture’.